If you have a large amount of credit card debt, you may struggle with the ability to pay your minimum monthly bill. Even if you are able to pay the debt, bills can become overwhelming, with much time and effort spent assuring the right amount goes to the right lender by the appropriate due date. Debt consolidation is a particularly good idea if you're making many payments to several different credit card companies every month. In essence, debt consolidation is just another credit account, but it is one large loan used to pay off all of your credit card accounts. Instead of paying three, or five, or ten accounts every month, you'll be making one payment to one lender every month. - Unsecured debt consolidation loans are loans made without any collateral. These are most accessible to people with good or excellent credit, and may carry a higher interest rates than secured loans for people with less than excellent credit. - Secured debt consolidation loans are loans that are guaranteed by property you put up as collateral. This can be jewelry, furniture, or electronics. Secured loans are usually available to people with anywhere from poor to excellent credit, as there is something backing up the loan. Use caution with secured loans, however; failure to make payments will result in your property being repossessed. - Home equity loans are lines of credit that are based on the equity you have built in your home. Similar to secured debt consolidation loans, home equity loans can be risky as your home is your collateral. Failure to make payments can result in foreclosure, so make sure you can make your payments every month. Consolidating your debt can save you money if you are able to find a consolidation loan that carries a lower rate of interest than the average of your current credit card accounts. It is important to shop around for a low rate, and pay attention to any fees that may be assessed. Many loans do have fees, and these costs could eat up any money you'd be saving by consolidating your debt. 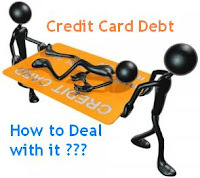 Often, credit card companies are willing to negotiate your balance if it is understood that you are having trouble making payments and may default on your debt. Basically, the company would prefer to receive a lower, negotiated amount than nothing at all. Draft a letter explaining why you want your balance lowered, and the reasons for the amount you want the balance to be lowered to. - The amount you "save" on your credit card bill is considered taxable income. This could push your tax bill higher, and even push you into a higher tax bracket. - Generally, credit card companies require the negotiated amount to be paid in full immediately. This is not a debt you can make payments on. - There will be a note on your credit report stating that your debt was negotiated for a lower amount, which can negatively affect your credit score. This won't lighten your current debt load, but it will stop it from growing. Stop charging items immediately if you have more debt than you can handle. Once you have caught up with your credit cards and zeroed out your balances, you can begin to charge small necessities and pay off the balance on time and in full every month.